Buka start -> run -> <ketikkan ‘services.msc’><tekan enter> -> muncul jendela baru services. Cari services ‘printer spooler’ diantara beberapa daftar servis yang ada, biasanya sudah terurut berdasarkan abjad. Jika sudah menemukan klik dua kali pada printer spooler. ubah menjadi startup -> ‘automatic’ dan tekan tombol ‘start’. Jika sudah running maka yang ada hanya tombol ‘stop’, maka tekan ‘stop’ dan ‘start’ lagi. Check di tab dependencies -> lihat apa saja yang ada dalam dependency program. Biasanya service ‘remote procedure call (RPC)’. Untuk memastikan lihat service ‘remote procedure call (RPC)’ apakah sudah running atau belum) jika tombol ‘stop’ atau ‘start’ tidak fungsi berarti status service remote procedure call (RPC) sudah running. Setelah semua selesai dilakukan restart komputer, dan mulai untuk print. Insya Allah bisa. First step go to start -> run -> <type ‘services.msc’><press enter> -> until shows the services window. Find/search the services ‘printer spooler’ on that bunch services, usually the services are sorted alphabetically. If founded, double click on that service (printer spooler). Change the startup option set to -> ‘automatic’ and press the button ‘start’. If the services already running on your computer theres only ‘stop’ button, press that ‘stop’ button and press the ‘start’ button again. Check in tab dependencies -> see if theres a dependency program. Usually the service ‘remote procedure call (RPC)’ are the dependency. Next is, click again -> service (local). Last step is to make sure that service ‘remote procedure call (RPC)’ which is the dependency of printer spooler services (is already running or not). If the either the button ‘stop’ nor ‘start’ didnt function, means the RPC services is already running. 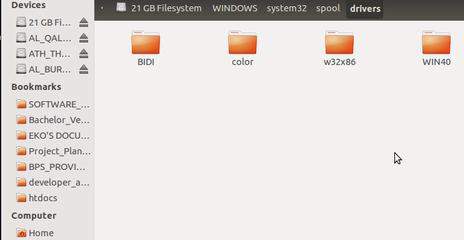 In folder spool, theres folder PRINTERS then delete all content inside that folder. Still in spool folder, go to drivers folder then delete all content. After that step were done, restart the computer and try to print again.